I admit, I don’t get to Vermont nearly enough. So, when it came time for the family to choose a location to spend Thanksgiving I lobbied hard for a place somewhere in Vermont. The Green Mountains have been calling my name and I needed to listen. My intentions were purely selfish, I wanted to do one of the 4000footers. As luck would have it the family picked a house in West Dover, near Mount Snow. This means I wasn’t going to be near any of the 4kers. I had already spent time running up and down Mount Snow at two Tough Mudders (Conquering the Tough Mudder and Teamwork and Tough Mudder) so I wanted somewhere else to go. After soliciting advice from friends on Facebook it became clear that Mount Equinox would be a great alternative. While scouring the internet for any information I could get on Mount Equinox I came across the website for the Equinox Preservation Trust. They had a great interactive trail map on their website along with some history about the Preserve. Another important piece of information I came across was that hunting was allowed over 1,300feet. Being that it was still rifle hunting season I knew I needed to wear my bright colors just to be on the safe side. My trusty orange Buff would be coming with me. I also found out in my searching that there is a road that leads up the mountain for visitors to go up during the warmer months. Hey, if there is a road to the top there must be some great views. My 3 hour drive from Connecticut to the parking lot on West Union Street in Manchester, VT was uneventful. My plan was to take the Blue Summit Trail up and back. Given more time I would have extended my hike to include a loop around Equinox Pond before heading up to the summit. At the parking lot there is a nice little information kiosk. Here they have trail maps for you to take. Even though I was planning a direct up and back route I decided to take a map to use as a reference. I also liked that the map had the ecology of the mountain and pictures of some plants that you may come across on your hike. The first thing that came to mind when I started up the trail was that it seemed perfect for cross country skiing. Well, not at that moment, because there wasn’t any snow at the lower levels, but later on when there was snow. The trail is nice and wide and in my mind I could easily picture it covered in snow with skiers gliding along. Then my mind wandered to snowshoeing. Clearly it was stuck in the nonexistent snow hoping that when I got higher I would see some of that lovely white stuff. Sure enough once the trail became more single track hiking, more snow started to appear. There were some slippery, icy spots but nothing that couldn’t be handled barebooting. I knew I was getting closer to the summit when I started to be surrounded by more and more spruce and fir trees. I picked up my pace in anticipation of the views that were waiting. The day was turning out to be clearer than expected and I couldn’t wait to look back down into Manchester. I blew past the spur trail to Lookout Rock and went straight to the viewing center at the apex of the skyline drive. Being that the road is closed for the season so was the viewing center. Outside though they have on their deck views to the north and south. Located on the lower level are pictures of the views with labels so that you can tell what you are looking at in the distance. As someone who hasn’t spent a lot of time in Vermont this was nice to get a baring of where I was in relationship to other locations. I ate my lunch at the south facing viewing area while chatting with a couple and their Dalmatian. The Dalmatian really wanted to get my Pop Tarts so I had to scarf those down. The wind started to pick up and I was cooling down so I decided to head off to Lookout Rock. For some reason I thought that Lookout Rock was going to be a nice big clearing. This was defiantly an incorrect assumption. Lucky for me I was hiking in the middle of the week and had the bench at the small clearing to myself. Although the size of the clearing was not big, the view looking down into Manchester was. The thing that stuck out the most was the white steeple of a church on the valley floor. This, paired with mountains in the background, was spectacular. I decided to run back down the mountain. I figured this would give me more time to stop at the Eastern Mountain Sports in Manchester Center before meeting up with my family. Higher up I was able to do some boot sliding on the snow, which I love. Lower down though I was slowed by all the leaves on the trail. The leaves were hiding rocks so I had to be more careful. I descended around 2,800feet in just under an hour. My legs wouldn’t let me forget this the following two days, as my quads felt like I had done a squat workout. Maybe I should admit that I was carrying 10lbs of bricks in my bag as training so the pain was totally self induced. 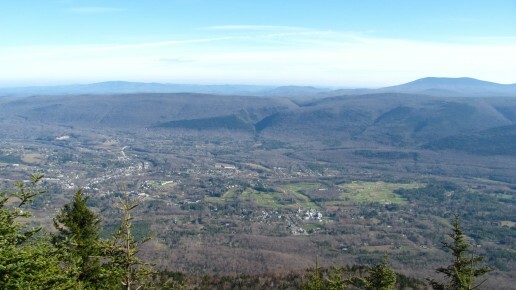 Even though Mount Equinox isn’t a 4ker I am very pleased by the suggestions my friends gave me to hike her instead. She is 3840feet which isn’t too shabby. Looking forward I would love to spend more time hiking and/or snowshoeing in Vermont. If you have suggestions of trails for me to visit please comment below.